Need a large kitchen with extra storage and more countertop space? The front kitchen floor plan is for you! This layout maximizes kitchen space and usually includes a central living room. These layouts are popular with families who have young children or RVers who entertain frequently. 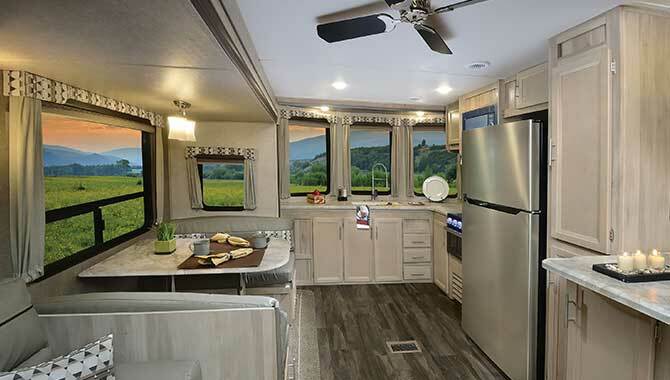 Front kitchen floor plans provide large amounts of kitchen storage and countertop space versus other RV layouts. This is an excellent feature for families with children or those who love to entertain. 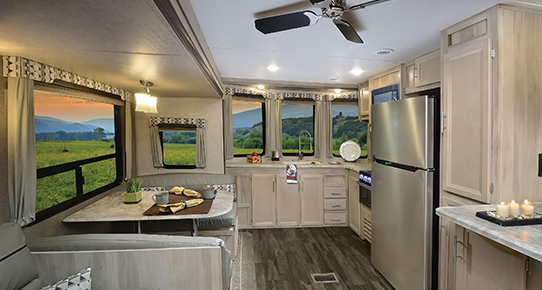 The front kitchen floor plan places the bedroom in the rear of the RV, allowing for more privacy in the two most commonly-used rooms. Again, this is a wonderful feature when your RV is full of friends and family. These layouts usually also provide a central living room and entertainment center, again ideal for those who welcome guests frequently. You'll find front kitchen floor plans in many types of RVs, including travel trailers, 5th wheels, and destination RVs. Shop our online selection of RVs with front kitchen floor plans at your convenience or visit our dealership to see your favorite models in person.